Sleeping bag liners are a useful but not 100% necessary piece of gear to add to your sleep system setup. They are fairly inexpensive and are recommended in certain situations. So you may ask what the heck is a sleeping bag liner? In your bed at home you have your mattress, your mattress isn’t disposable so to protect it and keep it clean people put bed sheets over the mattress. 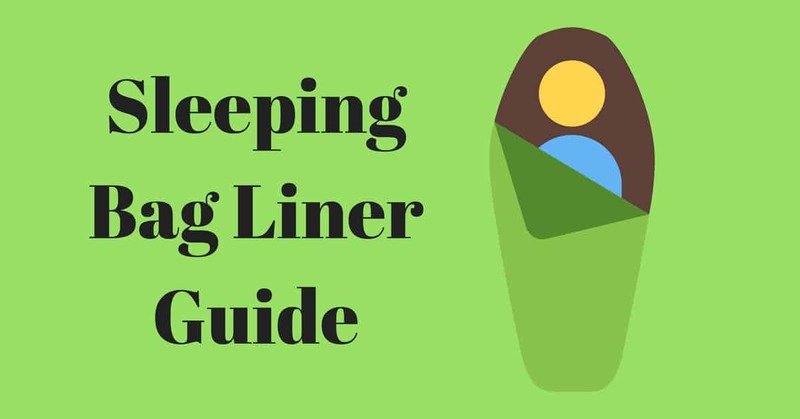 A liner does the same thing, it helps protect your sleeping bag from the dirt and grime associated with camping and hiking. At the end of a long day in the woods camping or on the trail hiking you will often have dust from the trail, sweat from the blazing sun or dirt from collecting firewood stuck to your skin. Even wiping down before bed you will still have some residual dirt on your skin, this can get on your sleeping bag, make it smell bad and potentially impact the temperature rating of your sleeping bag if it gets especially soiled. A sleeping bag liner solves this problem and is easy to wash to keeping your bag clean, thus extending the life of your sleeping bag. In addition to keeping your sleeping bag clean it will add a modest amount to your temperature rating (also known as r-value). Some companies say it can add extra warmth (about 10-15 degrees of warmth) to a sleeping bag. I have found if after crawling into my sleep system and was awakened overnight feeling slightly cold the liner would be enough to supplement the bag, adding an extra layer. The lesson here is do not depend on your sleeping bag liner for warmth, accept that it is a supplement that packs rather small and can help slightly in the temperature department in a pinch. How Do You Use A Liner? They look like a really thin sleeping bag without a zipper, almost like a really large pillow case, some are even mummy shaped for mummy sleeping bags. You slide it around your body and then as normal crawl into your sleep system with the it around you. What Are The Common Materials They Made From? The one I use is made from a thin fleece like material this is one of the cheaper liners on the market and I view it as a disposable item that is replaced every couple years. They can also be made from cotton, merino wool, fleece, silk and I have even heard of some people having ones made of down. Silk liners are one of the most sought after products on the market. Cotton liners are one of the most affordable sleeping bag liners on the market. One downside of cotton is it takes a long time to dry if it becomes saturated and they often are not as warm as other materials. I personally view a liner made from cotton simply as a way to keep you sleeping bag clean and not for any real warmth. Merino wool is a natural material from a certain kind of sheep, it is soft, warm and tends to not irritate the skin as much (or at all) like normal wool sometimes does. It is a good material for a sleeping bag liner as it ads warmth while also maintaining a fairly lightweight addition to your sleeping kit. One downside is wool often requires additional care when cleaning, and can be hard to dry without damaging the liner. Fleece is my personal favorite sleeping bag liner as it is economical, easy to care for, maintains the temperature rating when wet and can be washed in a standard washing machine with minimal extra care requirements. They also are made in different sizes and shapes, you will want to look for one that is at least as long as your body up to your neck and a similar shape so you do not get a lot of extra bunching at the top or bottom of your sleep setup. The extra material could create uncomfortable spots if you roll on them during the night. Silk is more costly but they compact better than wool or fleece. They tend to feel cooler when used in warm weather (when used to keep your sleeping bag clean), and still add some level of warmth in cooler weather. 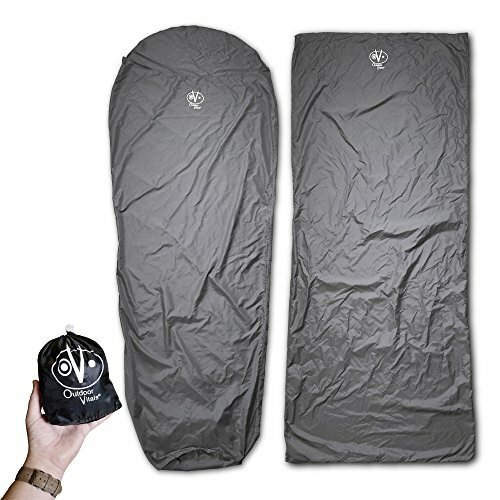 How to Choose A Sleeping Bag Liner? At the end of the day it is very much a personal preference. Some people prefer a certain type of material over others, other people may want one that weighs less or compresses more. You should take these factors into account along with your personal budget. I would recommend starting with something more affordable to see if you like using a liner and then upgrade as your tastes and budget allow. Do they protect you from bugs? Generally they do not provide any bug protection, some come treated with “insect shield” which is usually permethrin which will help keep the creepy crawlies away. How to wash the liner and how often? I would recommend only washing as they become overly soiled, this will help prolong the life of the liner. Different materials can withstand more frequent washings. For fleece and cotton you could likely wash them after every trip with minimal impact to the liner, while wool, down or silk you should wash less often and follow the manufacturer instructions to a “T”. It is important to follow the manufacturers instructions doing otherwise to lessen the life of your gear. What Else Can You Do For Added Warmth & Keep Your Sleep Gear Clean? To add additional warmth if you are cold sleeping you can get a better ground pad, wear better base layer clothing or even put a warm water bottom in with you (just be careful it doesn’t open). To help keep your sleep gear clean, I often recommend wearing a dedicated set of base layers or clothing that you only sleep in. You can also clean yourself up before bed. I will usually brush my teeth, wipe down any parts of my body that are particularly dirty from camping or hiking before I crawl in and head to sleep. Do this helps keep and dirt and grime off your gear and will in the long run prolong the life.